Beverley Mobsby pictured leaving Inverness Sheriff Court. 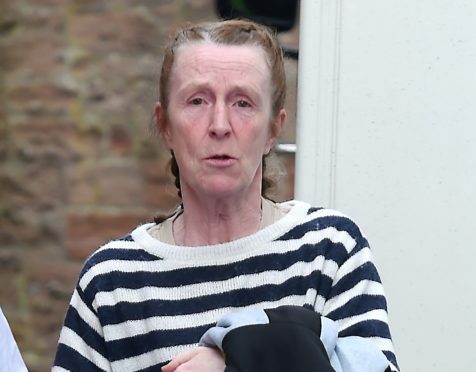 A “sense of betrayal” by her best friend provoked a grieving widow to exact revenge on her neighbour and his new partner. Inverness Sheriff Court heard that 52-year-old Beverley Mobsby smashed his windows, damaged his car and threatened to set fire to a garden shed in a two-week vandalism spree. Mobsby, of Jenkins Park, Fort Augustus, who has been in custody since the middle of February, was due to be sentenced by Sheriff Margaret Neilson yesterday. But after reading a background report, she decided to defer sentence again until May 9 for a psychiatric report. Defence solicitor Duncan Henderson agreed with this course of action. He said: “My client has a significant history of drug and alcohol problems. She feels she had a breakdown at the time due to the loss of her third husband and a sense of betrayal seeing her best friend and the neighbour she regarded as her new boyfriend in bed together. At an earlier hearing, the court heard that when Mobsby learned that one of her friends was in a relationship with the man concerned, she damaged their cars and their home in Jenkins Park. Fiscal depute David Morton described Mobsby’s campaign against the couple next door. “On February 8, she threw rocks, a log and other hard objects at their cars, causing a total of £550 worth of damage,” he told the court. Mr Morton added that more stringent bail conditions had been imposed on Mobsby after that incident. These, he said, directed her not to enter Fort Augustus or contact her neighbours. However, he went on: “But on February 19, she was seen to approach their home. “She picked up a large stone and threw it at their house, smashing a hall window. “Then she used a block of wood to smash another three windows, including one in a conservatory. He added: “After shouting, swearing and threatening the couple, she went into their shed where there were gas tanks kept. Mobsby was again remanded in custody.